Liquid Art Coffeehouse and Gallery is located 2 miles up the Killington Access Road, at 37 Miller Brook Rd. Look for the blue building! Reach us by phone at 802-422-2787. A small family owned and operated business, The Sarandreas opened this little gem in December of 2010. 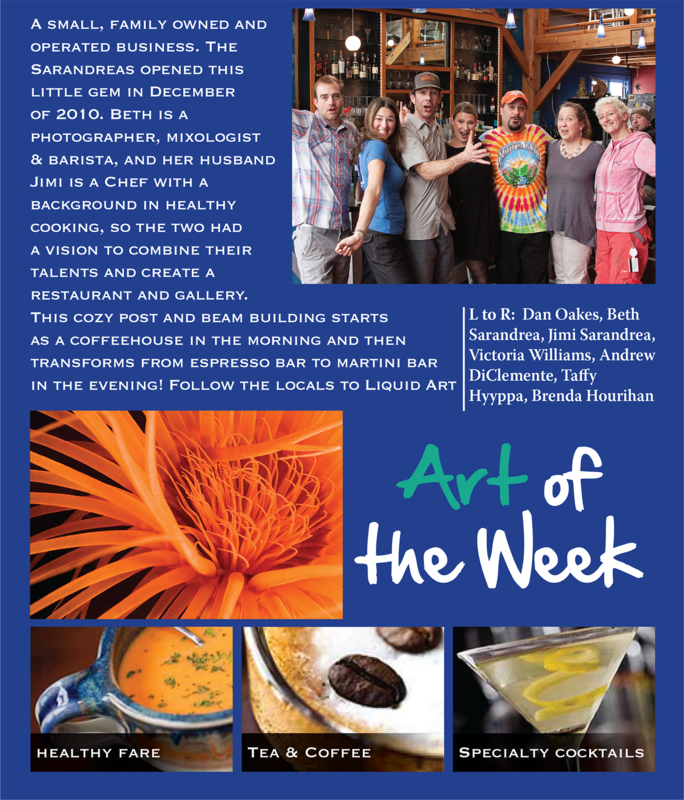 Beth is a photographer, mixologist & barista, and her husband Jimi is a chef with a background in healthy cooking, so the two had a vision to combine their talents and create a restaurant and gallery. Specialty coffee, creative cocktails, innovative, fresh, healthy fare and local artwork all come together under one roof – known as Liquid Art. Having the motto “Everything We Serve is Art,” we pride ourselves on serving artfully presented, delicious & fresh products. Providing our customers with outstanding service, quality, and a warm ambiance is our goal. Trained baristas serve gourmet Espresso drinks using our La Marzocco Espresso Machine, and VT Artisan Coffee & Tea which is locally roasted in Waterbury, VT. Our innovative signature cocktails speak for themselves. Just let the bartender know what you like and they will be happy to create an original cocktail just for you! There is also a selection of fine wines and microbrews. We are not just about beverages – our food menu is equally as delectable. The Light Bite menu offers something for everyone with many vegetarian options and daily specials that are all made with the freshest ingredients for breakfast, lunch and dinner. Five course Wine Dinners are held monthly. We love offering our space for private events, and are happy to cater to your needs. The gallery features local artists work including photography, paintings, pottery and jewelry that is all for sale. The atmosphere is cozy and warm, with leather couches, a built-in fireplace and a salt water reef aquarium. There is also a free book exchange, so if you want to come in to relax and read, feel free! Just bring one in, and pick one out to take with you. Or if you have work to do and need a change of scenery, there is free wi-fi available.